To all NTU students! It’s coming. That’s right folks! Our club’s long awaited Free Anime screening event! 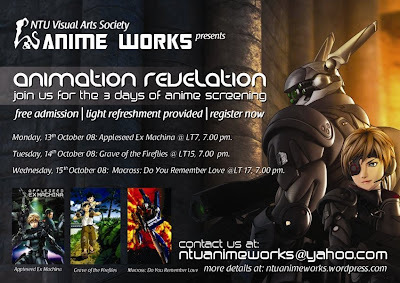 This October, our first “Animation Revelation” screening event will be held! We’re bringing you not One. Not Two. But THREE featured Anime movies! One movie each for three consecutive evenings from 7pm onwards, on the 13/10/2008 (Tuesday) to 15/10/2008 (Wednesday). So why Animation Revelation? Well, we hope that in attending our event, you will be able to gain new insights into the world of Animation. As you all know, we here in AnimeWorks LOVE our anime. We believe animation opens up whole new worlds of possiblities in storytelling and art, and we’d like to share that sentiment with you all by showcasing some of the finest animation works ever produced. What will we be showing? When and Where? Read on below to find out! After the screeening, we will be providing some light refreshements for you all to enjoy. We’ll also be holding a mini-exhibition on Anime history and subculture right outside the LT. So do stick around once the show’s over and mingle with your fellow Anime fans over some light drinks and snacks and bone up on you knowledge of Anime! So leave behind your stresses and worries for a few nights, and allow youself to be swept away as we journey into the amazing world of Animation! We hope to see you there.